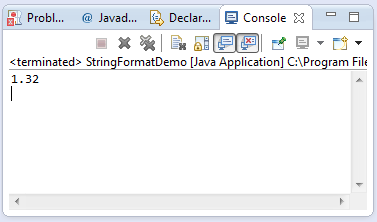 This java tutorial shows how to use the format() method of String class of java.lang package. This method returns a String representation of the result of the object args based on the format specified on the method arguments. This method is locale dependent as specified on the default locale. This format() method of String class change the method argument Object args into specified string format as method argument. The string format method is a static one thus it needs to be called statically like this String.format(format,args). This method is very helpful if our business requirements specified a format required. This example source code demonstrates the use of static method format() of String class. This example simply format a float object to display only 2 decimal point thus the format is %.2f. Let’s take a look on below example source code for better understanding of the usage of format() method.